I do so love an oldie but goodie. 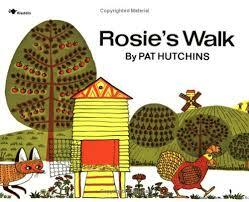 Rosie’s Walk was published in 1968. Rosie, a hen, is going for a walk. Little does she realize that there is a hungry fox following her everywhere. As Rosie walks, fox steps on a rake, falls into a pond, falls into a haystack, has a bag of flour emptied on him and then falls into a wheelbarrow which rolls into bee hives. Rosie completely misses all of the action behind her. She finally ends up at her chicken coop, just in time for dinner. Every time I turned the pages, my students would shriek with laughter when they saw what happened to the poor fox. They were very cute. I read this to my TK (Transkinder) class, with students who just missed the cutoff for kindergarten. They absolutely loved this book. 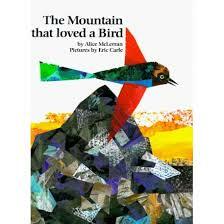 I then tried it with my preschoolers and found that they had a harder time following this book. I’d recommend it for TK through 1st grade audiences. So if you’re looking for a quick, funny read for your young students, here it is. This book begins with the words, “WARNING: DO NOT READ BEYOND THIS PAGE!’ Even the only slightly curious would want to turn the page. And, being more than slightly curious, I did turn the page, only to read the words, “Good. Now I know I can trust you. You’re curious. You’re brave. And you’re not afraid to lead a life of crime.” 🙂 The first chapter consists of all “x’s”. Yes, there are no words; because, of course, the first chapter would have revealed the names of the characters, the place where the story takes place and the dates. All those things are, well, secret. I can tell you this: The main character’s name is Cassandra, and she is a survivalist. She goes no where without her backpack of survival gear. She lives alone with her mother and often visits her mom’s friends, Grandpa Larry and Grandpa Wayne. Cass discovers a box called the “Symphony of Secrets”, learns that it came from the house of a dead magician. 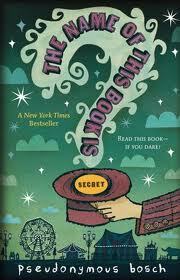 She and her new friend, a boy named Max-Ernest, believe that the magician is actually alive and crying out for help. This, coupled with the disappearance of a strange boy from school lead them on a chase to save the magician and the missing boy. I read this book to my son years ago, and we absolutely loved it. Since then, I’ve recommended it to countless students who never fail to come back to get book number two, If You’re Reading This, It’s Too Late. Don’t miss this great book! I’m a huge fan of wordless books for kids. This genre has really grown. It includes books for young students, like one of my favorites, A Ball for Daisy, by Chris Raschka, and complex and beautiful wordless books like The Arrival, by Shaun Tan, meant for middle schoolers. Younger students and particularly students who aren’t reading yet get such a feeling of confidence when they can read a story on their own. In the case of my library, students sit quietly and watch the story unfold as I turn the pages for them. Sometimes I have them tell me the story that they just “read”. This time, we just closed the book and smiled. The Red Sled is not a completely wordless book. The only words that appear are onamatopoeias. 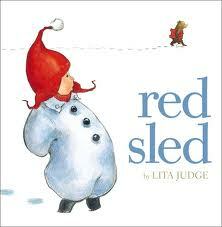 The book opens with a red sled sitting outside a house in the snow. A bear wanders by and notices the sled. He decides to take it for a ride, and what a wild ride it is! Soon, a rabbit joins him, then a moose, then two raccoons, an opposum, a porcupine and a mouse. The illustrations are wonderful, particularly the animals expressions as they tumble down the hill on the red sled. 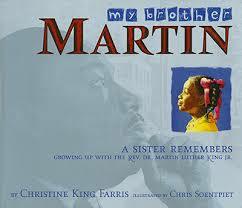 My students were so quiet as they read the book, then, they started smiling and soon they were laughing out loud. After the animals finish their sled ride, the bear replaces the sled at the door of the small house. The child who owns the sled walks out the next day, picks up his sled and notices bear tracks. The book closes with the child swinging from the antlers of the moose as the animals go on another sled right that night. This is a sweet, quick book that kids will really love.